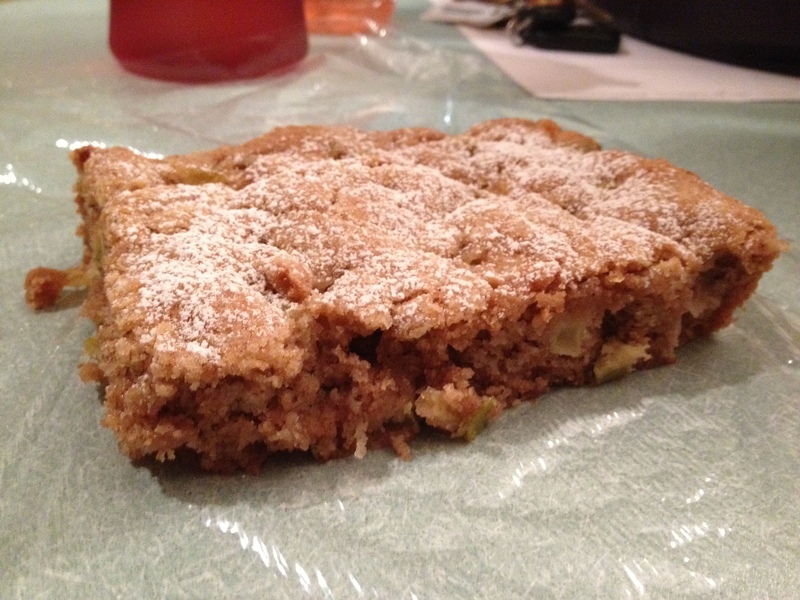 How about a quick and easy apple cake? The most time-consuming part about this is chopping up the apples. If you’re lazy like me, don’t bother to peel them. Just wash them well, and start chopping! I used Granny Smith apples because that’s what I had in the house. Use your favorite kind, or a mixture of sweet with tart. I didn’t chop the apples too much because I like to have pieces in my cake. However, if you don’t like biting into apple chunks, dice them finer. The batter will be very thick. That’s fine – just make sure you’ve got the dry ingredients mixed evenly with the wet ingredients before smooshing the batter into the pan. 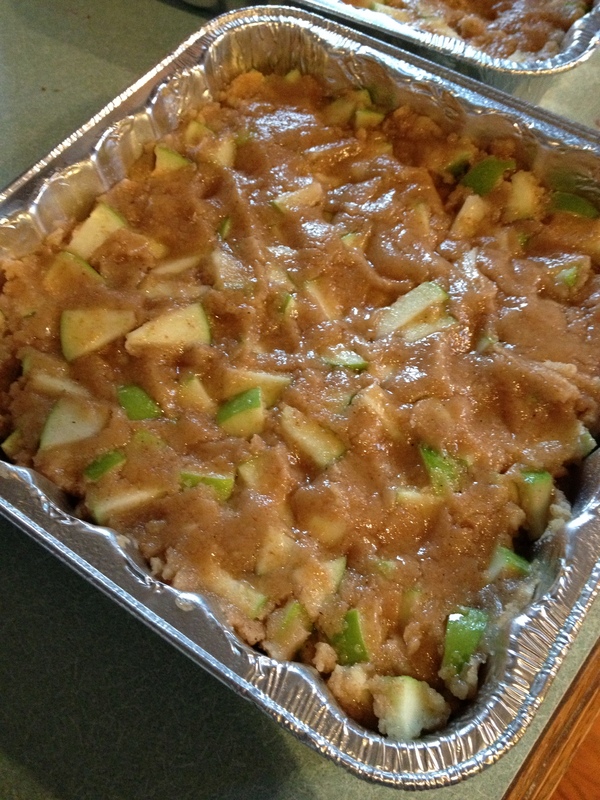 Make a 9 x 13 pan or split the batter into two 9×9 cake pans and keep one for yourself, and share the other with friends. Grease a 13x9x2-inch baking pan or 2 9×9-inch baking pans; set aside. In a large bowl, combine flour, sugar, baking soda, salt and cinnamon; make a well in center of dry mixture and set aside. In a medium bowl, combine eggs, oil and vanilla; stir in apples and nuts. Add egg mixture to flour mixture, stirring just until moistened (batter will be stiff). Smoosh batter into prepared pan. Bake at 350 degrees for 50 to 55 minutes or until a toothpick inserted in center comes out clean. Cool in pan on a wire rack for at least 1 hour. Serve slightly warm or at room temperature. If you like, dust with powdered sugar or top each serving with sweetened whipped cream and an apple slice. Slapped this together tonight – delicious! I used fuji apples (I think). Next time I will add more pecans because they are awesome. I wonder what walnuts would taste like in this? And vanilla ice cream. Mmmmmmm. Nuts and ice cream make everything better. 🙂 Glad you liked it! « New Format, New Dog!